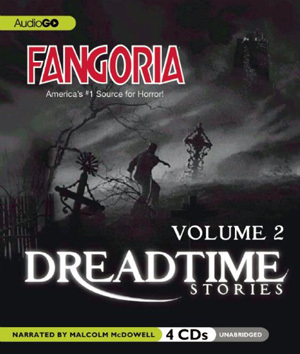 Fangoria's Dreadtime Stories with host and narrator Malcolm McDowell are fully–dramatized radio dramas to thrill you and chill you! These original short stories from bestselling authors are now available for the first time in a Collector's Edition, with extended scenes. • "A Heated Premonition" by Carl Amari and M.J. Elliott: Based on the famous short story "August Heat" by W.F. Harvey. It's the story of two men whose glimpses, each of the other's possible future, lead them to a strange and paralyzing standoff. • "The Dark Enforcer" by Barry Richert: The story of a comic book store owner who is tired of being bullied so he summons "The Dark Enforcer", mighty protector of the oppressed to vanquish his enemies. • "Table Scraps" by M.J. Elliot: Most politicians would kill for a high approval rating. The powerful Lorrimer family don't need your approval – but they kill anyway. Conspiracy expert Isaac Salt is determined to uncover all the Lorrimer's secrets, even if it means sneaking onto their private island. But what's waiting for him there is the last thing in the world he expects. • "Mercy" by Max Allan Collins: Mercy Mathers looks like a blonde angel, but everyone knows she's the wildest party girl in Clarion High. But when her boozy, slutty antics cause the death of nearly the entire high school football team's starting line–up, Mercy seeks forgiveness by way of religion. Once she's saved, Mercy feels compelled also to save the bad boys she once sought out for her own pleasure. Now she offers herself to compel them, too, to find the Lord. But bad boys tend to be bad, and to prevent them from backsliding, Mercy has to sacrifice them before they can fall from grace. But what guy would ever guess that the sexiest, most beautiful girl in school is a homicidal maniac on a mission from God? • "Talking in the Dark" by Dennis Etchison: Victor Rippon is a lonely man from a small town. Ever since his wife left him, he lives a quiet, bleak existence, with no friends to speak of. His only real interest is his favorite writer, Rex Christian. Victor is obsessed with Rex's horror stories, which somehow seem more real to him than his own boring life. Why do Rex's stories have such hypnotic power over his readers, until they believe that they are not only reading them but living them? As Christmas draws near, Victor has a chance encounter with Rex and learns the answer to this and the age–old question: Where does a writer really get his ideas? • "The Final Battlefield" by Barry Richert: After a four–year tour of duty in Viet Nam, Private Daniel Conway is glad to be home in Clover Ridge, Iowa. But his joy is short–lived when he is haunted by frightening visions of The Hangman, a vicious Viet Cong officer with a penchant for torture whom Daniel encountered during his stay in a prisoner–of–war camp. Pushed to the brink of madness by the continual appearances of his tormenter, Daniel is forced to ask himself an unthinkable question: Has The Hangman followed him home?